One of the things my husband and I like to do during the week (read: to avoid crowds) is to visit the San Francisco museums for their current exhibits. Over the last couple of months we’ve been to the de Young twice: first to see the Bulgari jewelry exhibit and more recently, David Hockney. Fans of many mediums and several forms of art, we always jump at the chance to see something new (to us). While the former was a bit of a disappointment I was captivated by several of the installations for the David Hockney exhibit. There was a mix of his classic oil works, charcoal drawings and Hockney’s more modern forms of expression using video and even works created with an app in his iPad. I was surprised to have enjoyed the modern installations (and the drawings) as much as I did; so much so that I purchased the same app (Brushes) upon returning home, imagining that I might be able to create something remotely as artistic. I’ve tried it…um, my work won’t be displayed in any gallery anytime soon. Lunch usually follows these museum visits. At the museum my husband and I make our way through the exhibit on our own, allowing ourselves to get lost in the works. Because we have similar taste we will often find ourselves lingering in front of the same painting but sometimes we’ll look for each other to highlight one work that one of us particularly liked that the other might not have noticed. We spend our lunch date discussing the works more freely, away from the hush environment of the exhibits. Traditionally we have returned to the same spot where we had our first lunch date but this year we’ve ventured out to some other favorite places. Spruce was a recent destination. Serving California-inspired cuisine in the Presidio Heights neighborhood, Spruce is popular with many San Franciscans. The atmosphere in the dining room is a little more formal than at the bar but not stuffy. Between customers you might see a staff member laying a tablecloth and ironing the creases out right at the table before it is occupied by the next guest. On this last visit I ordered duck confit with Israeli couscous and greens. The duck was prepared perfectly but surprisingly what impressed me was the side. The Israeli couscous was tossed with diced peaches. I was so wowed by the pairing–and the champagne that we drank with it–that I have been dreaming of recreating the dish at home since. Here’s my take on that enjoyable meal. I made substitutions for every component of the dish at Spruce but the harmony on the taste buds was exactly the same in my version. As much as I love duck, I used pork chops instead. I’ve had fear of preparing pork chops for so long, afraid of overcooking them, so this time I brined mine in a mixture of spices that infused the meat with the subtlest, most pleasant of flavors. For me, the star was the side dish. Instead of using couscous I substituted one of my favorite pastas. Fregola Sarda is a Sardinian pasta. The little nuggets are toasted after they’re dried, adding a nutty quality to the pasta and a perfectly chewy texture when cooked. Peaches are done for the season and I considered apples or pears for this dish but I’m so obsessed with persimmons lately that I knew they’d be ideal here as soon as I spotted them sitting on my counter. If you’ve never had persimmons I encourage you to give them a try. They have a subtle, delicate flavor that is hard to describe. Not overpowering like some fruits might be when combined with savory components. Their texture works well here, too, standing up to the toothsome fregola pasta. Now for the preparation. I wasn’t sure how Spruce prepared their couscous so I let my taste buds guide me. I took advantage of the flavor left behind by the seared chops in the skillet and deglazed the pan with a little rosé. With a little olive oil and chicken stock the fregola pasta that had stuck together a little in the colander began to find their own again, absorbing more flavor along the way. In a bowl I tossed them with the persimmon and I threw in some mint leaves for balance and a little more olive oil and some fresh lemon juice. 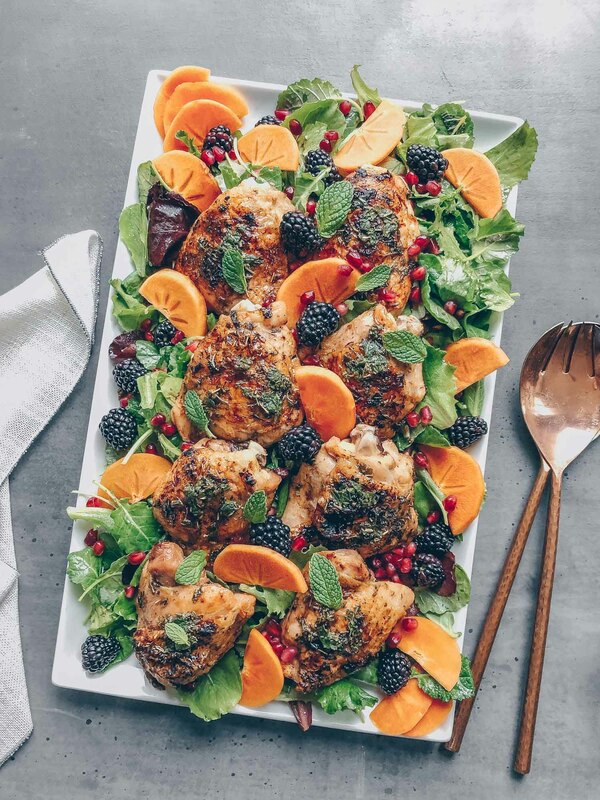 For me and my husband this meal, served with sautéed dandelion greens, was an immediate winner. It was a masterpiece for the palate and we’re already looking forward to its next appearance on our dining room table. If you will try only one thing from this plate, try the fregola sarda with persimmon. I may not be capable of recreating David Hockney’s magic using the Brushes app but my take on Spruce’s dish made me feel like an artist in the kitchen…at least on this particular night. The only thing missing was the champagne. 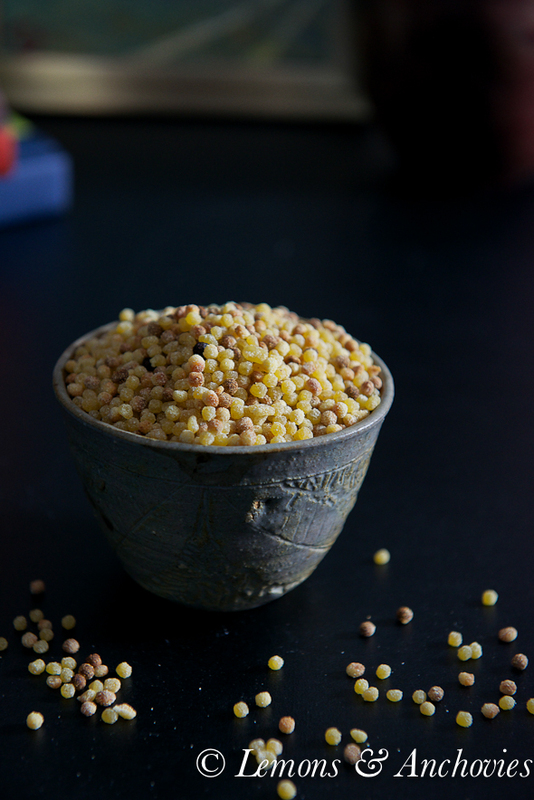 Similar to Israeli couscous, Fregola Sarda is dried Sardinian pasta that is toasted, resulting in a wonderful nutty flavor and the perfect toothsome texture. 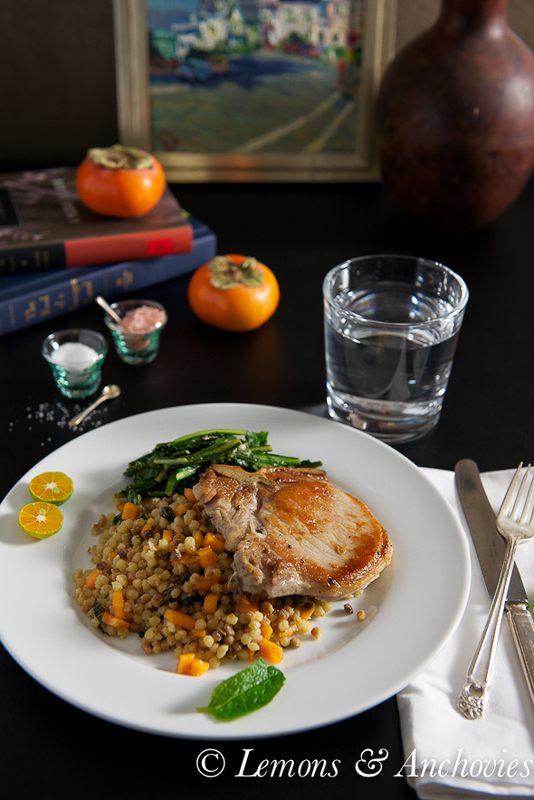 Tossing it with a little wine, persimmon and mint makes it a perfect accompaniment to pork chops. Brine the pork chops (optional step but recommended): In a saucepan large enough to accommodate the chops, add the first 2 cups water, cinnamon stick, thyme, star anise, salt and coriander seeds. Bring this to a boil on the stove just to dissolve the salt and coax out the flavor of the spices. Set aside for a few minutes to let the flavors infuse the liquid then add the remaining two cups water. Make sure that the liquid is at room temperature or tepid before adding the chops. Leave the meat in the brine, refrigerated, for a minimum of 1 hour up to 24 hours. To prepare the Pork Chops: Preheat your oven to 350 degrees F. Take them out of the brine and pat dry. It would be better if they were close to room temperature before you cook them. Season with a bit of salt and pepper on both sides. Heat about 2 tablespoons of oil in a cast iron skillet over medium-high heat. When the oil is hot, Add the pork chops to the pan and sear the first side for 3 minutes or until the meat is nicely brown. You can then flip the meat over and transfer to the oven to finish cooking but if you're also preparing the fregola pasta, transfer the meat to a foil-lined baking sheet instead so you can use the skillet for the pasta. The meat may take 4-6 minutes depending on the thickness of the chops. While the meat is in the oven, prepare the fregola pasta. 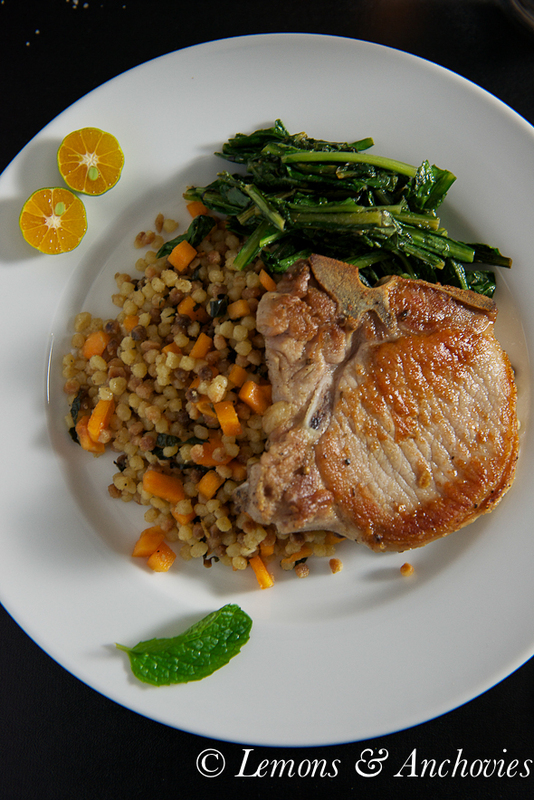 To prepare the Fregola Sarda: Using the same skillet that the pork chops seared in and keeping the heat at medium or medium-high, add a splash or two of wine to deglaze. Scrape the bottom of the skillet to loosen the flavor from the meat. You can add a bit more oil but if there's enough to loosen the starchy pasta you can skip this step. I added about 1 more tablespoon before adding the fregola pasta to the skillet. Stir fry the pasta in the oil for a minute or two, just until the pasta begins to separate again (the starch develops when you drain it after cooking so some may stick together but the oil loosens them up again). Add a couple splashes of chicken stock and just to loosen the pasta a bit more and sprinkle a little fresh lemon juice. If you feel it needs salt, add just a little. Transfer the stir-fried fregola sarda to a bowl and toss in the persimmon and mint. Taste again--I added a bit more lemon juice and drizzled a bit more olive oil but this just my preference. Set aside. To prepare the dandelions greens: Stir fry in the same skillet you cooked the pork chops and the pasta in or use a different pan. Heat a tablespoon or two of oil, add the sliced garlic and when the garlic is fragrant, about 10-20 seconds, add the dandelion greens. Cook, stirring occasionally, until the greens have wilted down. Season with a bit of salt and add a bit of lemon juice for flavor. 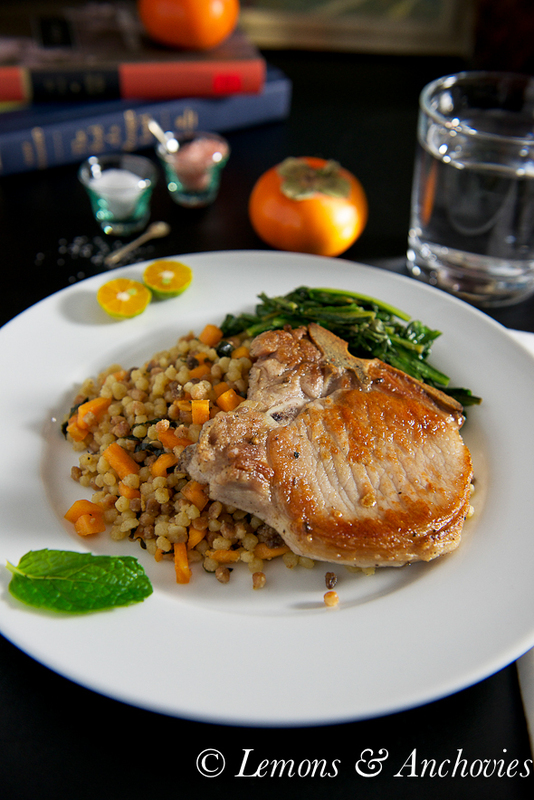 Arrange the pork chop, pasta and greens on a plate and serve. The cook time doesn't include the brining time. My tip: You can have this dish ready in under an hour from prep to serving time. Preheat the oven, take the meat out of the fridge and boil the pasta water first. If your meat is thicker than what I've used here, take it out about 30 minutes before you start cooking. Beautiful dish! I’m glad you went with pork instead of duck, the latter can be too gamey. Pork is slightly intimidating but this recipe looks too scrumptious to pass up (I’m glad persimmons made another appearance!). That looks amazing – definitely a work of art. I will have to keep my eyes peeled for fregola sarda at the Italian market. And I don’t think I’ve ever had a persimmon … sounds like I have to try this sometime! That’s a delicious dish! 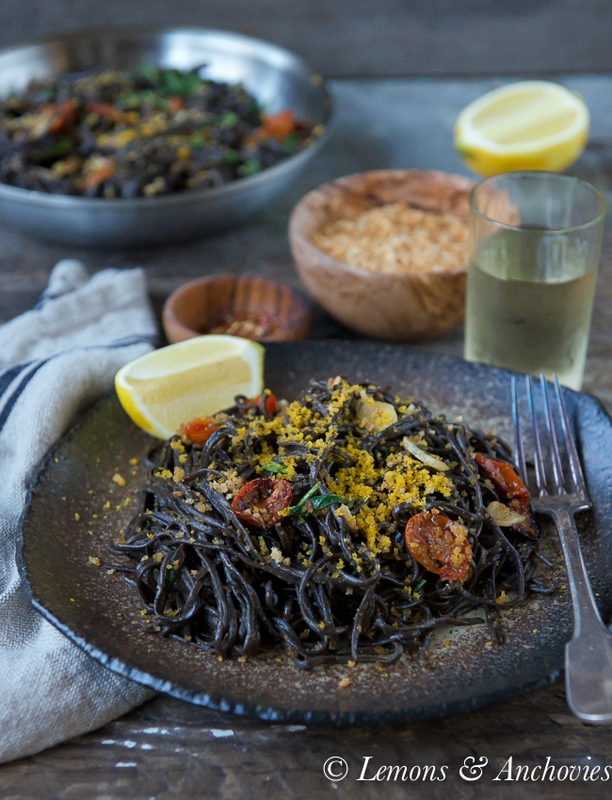 This type of pasta is wonderful and so versatile. Wow, that sounds amazing. Nicely done. Such a sophisticated dish, I love that Spruce was your inspiration! I’ve never tried fregola but now I must! This dish is indeed inspired. I can’t get that pasta here, but I will try it with cous cous. I still have more persimmons on the counter. I wish I had some pork chops though. I’m thinking of brining the turkey, but I am still trying to figure out how to fit it in the fridge, lol. What a fun afternoon, I need to get out to the city more. Now I must visit Sardinia! Thank you! 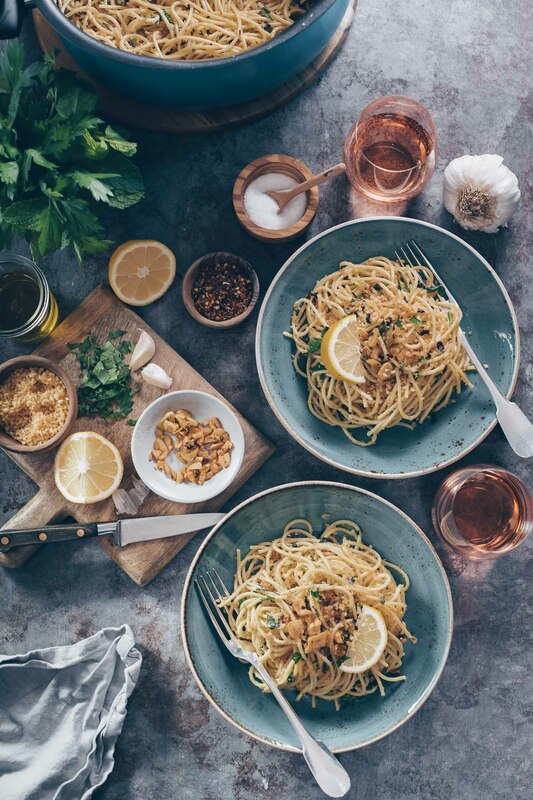 What a lovely take on a delightful meal…I can’t wait to recreate it in my kitchen! And I just love reading about your museum date. It sounds like my kind of day! I hate crowds at museums so I should totally try to go during the week!